Lucky me. Twice in one week I got to see another one of my all-time favorite bands/musicians. Yngwie! I think this was 8th time I have seen him since 1986 (Triumph/Yngwie). Even though many of his recent albums have been a bit lackluster, he’s still quite entertaining live and just being able to watch him play is worth it. I’ve been working out of town during the week in Dallas for the last 3+ months and haven’t really explored the music scene up here much and regrettably missed some quality shows, but there was no way I was going to miss this one. I bought my ticket on Monday at Wal*Mart of all places. They were the nearest Ticketmaster hub to my hotel. I don’t like going there and it just felt weird buying a concert ticket there. But no bother. 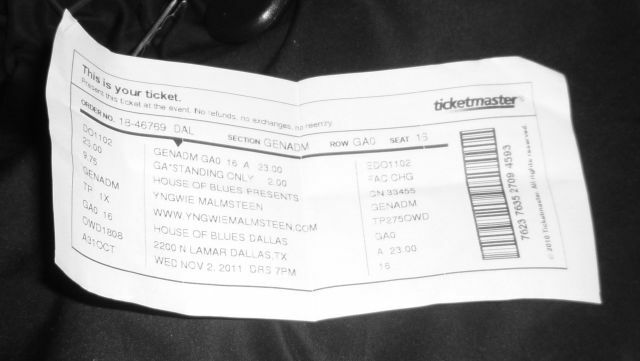 Last night’s show was at the House of Blues in downtown Dallas. I went down right after work and it only took a few minutes to get there from the office. It was a bit odd, though. Downtown Dallas is huge but last night it seemed like such a desolate place. Other than the parking lot outside of the venue, I didn’t see anyone out and about. Maybe the cold front that blew in that evening kept some folks away. I liked it down there, though. I love city living…concrete and steel for me! Doors opened to the venue at 7PM and I got there around 6PM. Because of the storm that was brewing, I decided to just eat there. Wasn’t too bad but of course a bit overpriced. Checked out the merch booth and didn’t see anything that really caught my eye. Opening band went on promptly at 8. They were called Little Green Men and hailed from Fort Worth. While they played a tight set and there were some good guitar solos, the band was not my thing, not in the least. I was pretty bored and just wanted them to stop playing. Just give me some Yngwie! the stage almost behind the wall of Marshalls…17 cabinets and 27 heads. No, really! I think that was the biggest setup I’ve seen him use ever. Of course most are only for show, but still…80s excess at its finest! The keyboard player was at the far left of the stage almost completely out of sight and the bassist hung around that side as well. I mean, c’mon. This IS the Yngwie show, right? The lights die down and you hear the keyboard intro to Rising Force (From Odyssey), then the drums kick in and the band hits the stage and kicks into the song full force. For as much as I have slagged Ripper Owens over the years, he sounded pretty good going into the set, much better than he sounded when I saw him with Yngwie in San Antonio a couple of years ago. The setlist stuck with a lot of newer material and I think that’s mostly because Ripper can’t sing a lot of the Joe Lynn/Jeff Scott Soto era stuff. Not many can. He did sound good on Never Die as well. Yngwie unleashing the fooking fury! that, I don’t know happened, but for the last part of that song, he sounded like he was singing something different. Sure, the lyrics were right but he had gotten so out of key that it was painful to hear. Not sure if he lost his inner-ear monitors or what, but the end of that song was horrid. It then kicked into Gates of Babylon and he sounded fine in that. I’m sorry, but he can’t carry the Turner/Soto stuff. I really wish Yngwie could find someone else who can handle all eras of the band vocally. Not to mention that Ripper sounds so “enhanced” on the last 2 Yngwie albums. Patrick Johansson is a killer drummer, unfortunately all you could hear was his kick and snare. He had toms, but they were so low in the mix that they didn’t matter. Same with the keys and bass. There were a few moments where Yngwie and the keyboardist were playing together and you could hear him somewhat and the guy was really good. 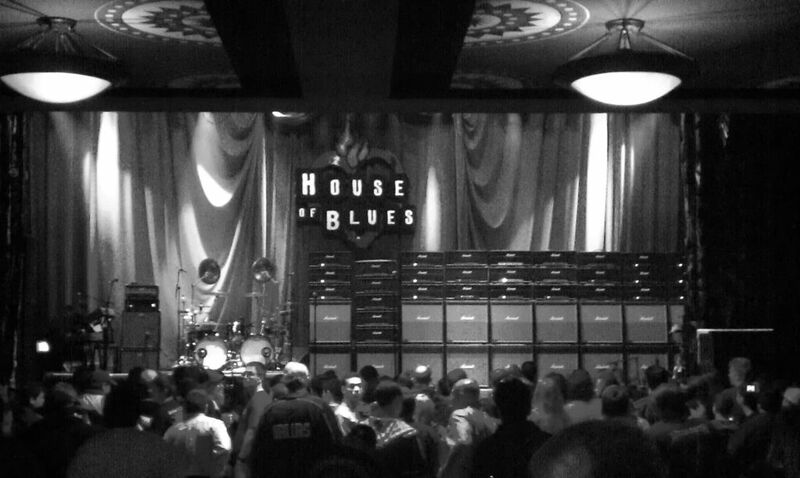 The bass was practically non-existent, which is typical for an Yngwie show. Now we get to Yngwie. The giant Swede. The man took what Uli Roth and Ritchie Blackmore and created a whole new genre. Sure, in recent years he plays fewer riffs and just solos everywhere, but he’s still incredible and fun to watch. The last 3 times I have seen him, he really seems to be having fun on stage. He has mastered the art of kicking guitar picks into the crowd. I think Rick Nielson of Cheap Trick is the only person to throw out more picks. I stayed back by the soundboard for the show. Attendance seemed to be around 300-350, not too shabby, but seemingly small for a club that holds 1700. It was a fun show. Not my favorite show that I’ve seen of his, but still quite enjoyable. I try not to miss him if I can help it. I’m glad he’s still out there touring and still glad I’m able to see it.